Nice pickups! Thank you for a link, John. I gonna buy it soon. But, wich one is better? I'm amazed to see the Strat opened up and displaying the wiring etc... never thought any of us would ever see that. looking at the wiring it appears that he had his tone control wired like a"volume" and then directly through the capacitor to the volume pot. crazy, but i know what i'm going to try. hahahaha(evil laugh). i just need to know what cap that is, it's small, maybe a .047uf poly film 100v ? wow sometimes i get carried away but i'm so happy to see this picture of the guitar's insides. thanks to Kent and the Gallagher family. leprechaun1 wrote: looking at the wiring it appears that he had his tone control wired like a"volume" and then directly through the capacitor to the volume pot. crazy, but i know what i'm going to try. hahahaha(evil laugh). i just need to know what cap that is, it's small, maybe a .047uf poly film 100v ? wow sometimes i get carried away but i'm so happy to see this picture of the guitar's insides. thanks to Kent and the Gallagher family. Can you make a handmade drawing of it on the paper and put it here? I'll be a very grateful. I'd like to have the same wires circuit that Rory had. hello jim, i'll try to get a sketch as soon as i can. the wire in the white sheath is still puzzling me. it is the negative conductor as usual but the way it looks the wire is soldered to the pot body and then to the left lug. i first want to try it on my strat before i come to a conclusion. it will take me a few days to get the time to experiment with it. i'll be sure to let you guys know. if you want to go ahead and try the set up yourself. best of all it can be easily reversed. i was listening to Rory's last montreaux concert and it's almost like his tone was acting as a volume with the sound being filtered through the cap directly.although thats sort of how a tone control works. it has to be a do-it-yourself mod. most techs would not wire a guitar in such a way. Rory was always an independant fellow. i still like his sound with Taste and on his early solo albums; stat(set up normal no mods), rangemaster,vox ac30. it's been a while and sorry it took so long but i did the mod to my strat as "I" saw it and i wasn't too impressed with it. i'm just not sure if Rory did it himself or had a tech set it up this way. the result wasn't at all what i expected. the tone acted like a volume with a capacitor as a filter before it went "dead". i think i like the basic strat set up or the single tone control(normal wiring) which gives a more reasonable control over all pickups. if anyone tries the set up like Rory had and gets a different result let us know. i'm sticking with a normal strat set up(because i like the Taste sound and early solo album sound with the AC30 and rangemaster).some folks may have pups different than mine so your result may vary. of course i could've been worng on the way i viewed the set up from the pics. Thank you Leprechaun for the work you have made. Anyway, this says again that best wire is default fender strat wire..
the best result i can say it sounds like is the 1994 concerts or anything later that exists. you can hear him turn down the tone and the guitar gets very dull. mine actually went almost "dead" which maybe the tone acting like a second volume control. it's a strange effect it gets dull and then goes off. you get the "faux wah" effect but it turns off. i just couldn't be sure of that ground wire on the tone control. i think it was meant to sound like a normal master tone control. my set up did not sound like the clip of Johnny Marr playing Rory's guitar. like i said my view of the wiring may have been wrong. but i called it like i saw it. my capacitor may have been wrong as well. I have a couple guitar questions. Hope to find an answers here. 1) I have my MIM stratocaster of 2006 (pretty old body). Situation of not enjoying myself of the tune of strat leads me to change the single coils. I wish to order Kent's RG pickups. What do you think how much the sound of my MIM will change after this replacement? 2) About Kent's RG. 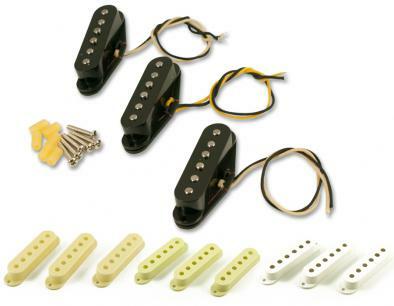 How about shielding guitar after pickups replacement? Or maybe that new single coils doesn't make any noise? 3) Does it a good idea to shield the body of the strat by cupper tape? 4) There's (at photo) under Rory's pickguard, inside of the body we can see something looks like a black tape. Is it a body shielding? Which material?